The former CalPERS CIO will oversee six investment team leaders and bolster the investment bank’s relationships with its asset owner clients. Morgan Stanley has created a new position, and it’s being filled by Ted Eliopoulos, the departing chief investment officer of the $360 billion California Public Employee Retirement System (CalPERS), the bank confirmed. Eliopoulos’ new role as vice chairman of investment management and head of strategic partnerships will be waiting for him in January, when he moves to New York, he said in an interview with Pensions and Investments. In addition to strengthening Morgan Stanley’s asset owner relations, Eliopoulos will work closely with investment and client teams across its business to deepen partnerships with top clients and serve as a senior advisor to CIOs. He will report to Daniel Simkowitz, the bank’s head, join the investment management operating committee, co-chair the investment management’s sustainable investing council, and sit on investment committees in Morgan Stanley’s private businesses, according to an internal memo obtained by CIO. “Ted’s unique perspective leading a world-class asset owner, as well as his deep expertise in alternatives, ESG, and portfolio construction, afford him a unique perspective that will help MSIM deliver differentiated value to our clients,” Simkowitz said in the memo. Eliopoulos knows Morgan Stanley because the fund hired the bank to help stabilize and rebuild its housing portfolio, which lost $3.2 billion in fiscal 2008, bringing its $9.3 billion in assets down to $6.1 billion. Today, housing occupies about 3% of the fund’s $31.8 billion real estate portfolio. Due to his previous work with the organization, California state law prevents him from approaching his former institution. 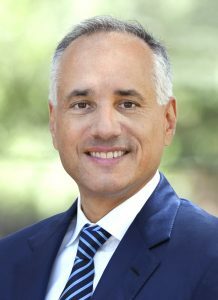 Eliopoulos became CalPERS CIO in 2014. At the time of the financial crisis, he was the plan’s head of real estate. After four years as CalPERS’ CIO, Eliopoulos announced he was leaving the pension fund in May to head east with his family. His last day was November 16. Ben Meng, a former deputy CIO at China’s State Administration of Foreign Exchange and also a previous CalPERS director of asset allocation, will replace him as chief in January. CalPERS declined comment. Morgan Stanley could not be reached for comment.